The New Craftsman Gallery is one of the most important spaces for 20th-century artists in St Ives, nurturing, in its early days, the reputations of figures such as Wilhelmina Barns-Graham, Bryan Winter, Patrick Heron and Peter Lanyon. This September the gallery is hosting an exhibition showcasing the work of Matthew Lanyon, Jack Doherty and Janet Leach. For the September exhibition, we also created invitations for ceramicist Jack Doherty. A trifold design – printed on 350 gsm paper and coated in a matte silk sheen – it is tactile to hold. The simple design inside provides a beautiful glimpse of the visual and physical process that forms a part of Jack’s unique work and the striking colours that make them so unique. In early 2017, we were asked to rebrand the gallery. This included signage, print materials and a custom website which will be going live later this year. For each exhibition, we produce print catalogues, invites, window signage, advertising and price lists. We liaise directly with the artists when producing the print catalogues to ensure we are presenting their work in the most accurate way possible. Working with industry standard photography software, we sit with the artist and adjust the individually scanned artworks on screen. This ensures we are able to produce print which looks very close to the original artwork. We also supply pre-press Epson proofs from the St Austell Printing Company’s own calibrated proofing printers in order to fine tune the process. Each catalogue is influenced by the artist themselves but is ultimately very simple in design. The overall aim is to present the artworks in the clearest and unhindered way for the New Craftsmen’s clientele to enjoy and hopefully make a purchase from the gallery. An online version is also produced and showcased on the Issuu website. Chosen for their ethical values and use of sustainable printing methods, St Austell Printing Company produces all the print materials and mailing for the New Craftsman Gallery. 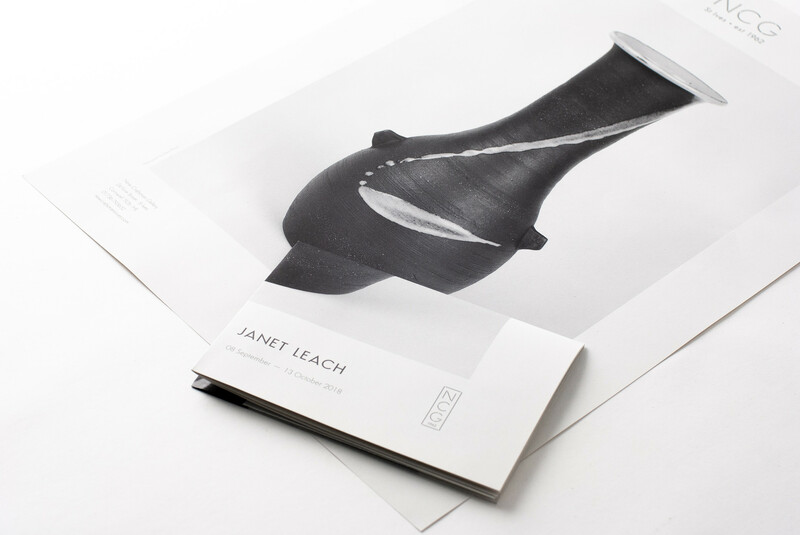 For Janet Leach (the original founder of the New Craftsmen Gallery) we created a bespoke limited edition print that formed the structure of an invitation. The A2 print doubles as a catalogue with a collection of Janet’s work featuring on the back, folding delicately into an A5 rectangle. Printed on Cyclus paper, the design forms three purposes: a limited edition print, a catalogue and a price list holder – encapsulated in one simple innovative A2 print – fitting seamlessly through a letterbox to form an interactive invite. Newer Post Studio Black Friday Picklist	Older Post A feast for the eyes – Hub Launches new Menu!